These cookies are my weekly installment of baking up the cookies you said were your favorites in my cookie cookbook giveaway. I’m still baking my way through the top 10 and can’t believe I have never made macadamia nut cookies! 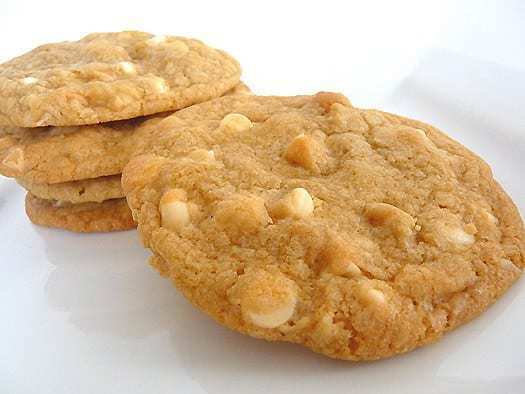 I actually have never even eaten a homemade macadamia nut cookie; only the large bakery-style store bought variety. Needless to say, I’m thrilled to have another fabulous cookie recipe tucked into my apron pockets! 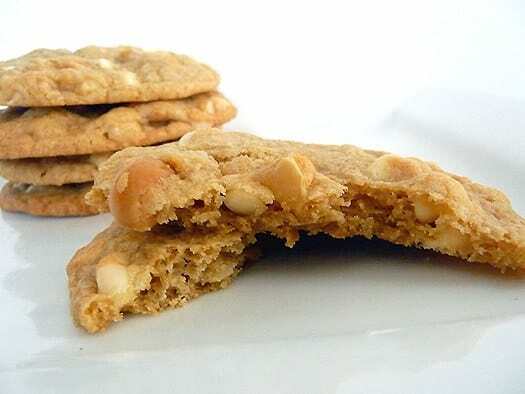 I used roasted and salted macadamia nuts – the salty flavor mixed with the sweet of the white chocolate and cookie dough is a fabulous combination. These are definitely one of the tastiest cookies I’ve ever made. Can you believe that of all of the baking cookbooks I own (which include big ones like Dorie Greenspan, Baking Illustrated, Williams Sonoma, etc.) not ONE has a recipe for White Chocolate Macadamia Nut cookies? Maybe it’s just me, but I found that to be incredibly bizarre for how popular these cookies are! So I started poking around the web for recipes and of course there were more than enough for me to wade through. This one, however, caught my eye because I immediately recognized the ingredient list (quantities included) as being almost identical to the Thick and Chewy Chocolate Chip Cookie recipe that has become my standard. That’s all it took for me to pick this recipe out of the bunch and I’m so glad that I did – they’re fabulous! The cookies are slightly crisp on the outside with a soft and chewy interior, full of chunks of macadamia nuts and white chocolate. Truly an awesome cookie. These cookies are perfect for snacking! 1. Preheat the oven to 325 degrees F. Grease baking sheets or line with parchment paper or a silicone baking mat. 2. In a medium bowl, whisk together the flour, baking soda and salt and set aside. 3. Beat together the melted butter, brown sugar, and white sugar. Beat in the egg, then beat in the egg yolk, then beat in the vanilla. 4. Gradually add the flour mixture to the sugar mixture until just moistened. Stir in the macadamia nuts and white chocolate chips by hand with a rubber spatula. 5. Roll into balls or drop by heaping tablespoons onto baking sheets, and press down on the cookies with your palm a bit to flatten (not too much!). 6. Bake for 12-15 minutes or until the edges look golden brown and the middles don’t look quite set. Allow to finish cooling on the baking sheet. I just made these! These are delicious! And so easy! Your site is my “go to” for the best baking recipes! Fantastic! I used chopped white chocolate from a baking bar, worked like a charm. I have a Ghirardelli white chocolate (premium) baking bar. Was wondering if its ok to use instead of the white chocolate chips. Excited to try this recipe, have never baked WCM cookies before. Weird cause I LOOOOVVVVE em! Yep, you could do that! Just know that the chocolate will melt into the cookie vs chips which stay fairly in tact. I had the same questions:) How did they turn out with the baking bar? These cookies are the best, I use Aussie salted Mac Nuts chopped up and set a side, then I make the dough and roll them in the nuts. For a different taste I add some coffee granules to the mix as well. I tell ya Yummmm. Thanks Michelle for sharing these yummy morsels with us. Do you think you could add raspberries to this recipe with fewer choc chips? Hi Helen, I would not recommend adding fresh fruit, especially raspberries. They will break down when mixed in and will create too much moisture in the dough.